Customization made simple. The Kendall Custom Dining, Bar, and Counter-height tables, along with the newly introduced Kendall Custom Desk, are designed to fit. Proportioned for the modern home, the Kendall collection of tables adapt to any space, any style, and any need. The clean-lined metal base is available in a durable stainless steel, matte black or white finish. 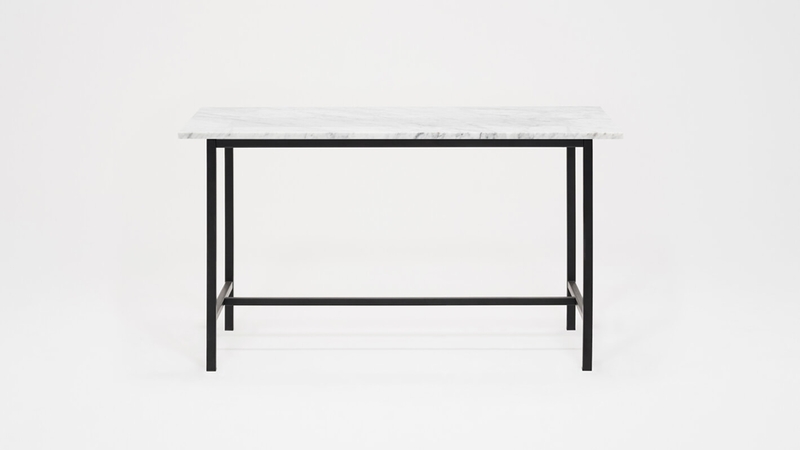 The understated base highlights honed Italian marble table top surface. The Kendall Custom Dining Table is now available in three widths that can accommodate four to eight guests. One (1) year warranty against material and workmanship's defects. View complete EQ3 Casegoods Warranty . Please note that marble top weighs 165 lbs and therefore requires two people to lift it. Marble is a naturally porous material and is absorbent, therefore spills should be cleaned immediately. Wipe clean with a soft, damp cloth.